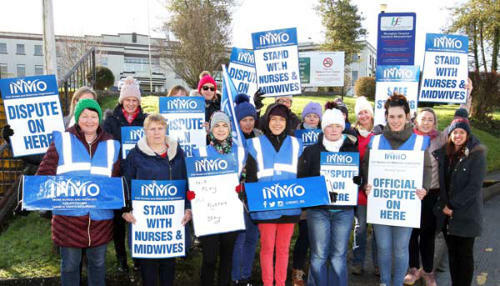 Nurses belonging to the Irish Nurses and Midwives Organisation resumed their strike action this morning all over the country in a dispute over pay, lack of resources and staff shortages. This has caused major disruption to many services and many patients have had their appointments and procedures postponed. Every effort has been made to deal with emergencies but there are going to be times when this will not happen. It is too bad that this problem has been allowed to escalate to this level and it is not just the present Government who must take the blame. Ever since I became involved with the health services of this country both as campaigner and as patient in a number of our hospitals it was obvious that there was a shortage of staff and a lack of resources, which put a serious stress level on the workers. The Community Alliance constantly warned that this problem needed an immediate solution but we were ignored. Above are Nurses and Midwives on the picket line at Monaghan General Hospital. Then when they began closing hospitals like Monaghan General, the local Community Alliance and the national Health Services Action Group (HSAG) gave the warnings to Government that this was going to become a major problem and one that they would eventually have to solve and the sooner the better for patients. Since then, due to lack of staff, patients have been suffering, waiting lists gave reached disastrous heights, mistakes have been made, more nurses and doctors have retired or emigrated to get away from the stress and from the dangerous situation that when things went wrong, as they did, the finger of blame would be pointed at them rather than Government, the Minister, the Department or the HSE. Patients languish on trolleys in cold draughty and busy corridors, and on beds in crowded wards where nurses are running about trying to attend to patients and to make sure they do everything right for every patient as best they can while they go without meals, breaks and rest. And still the Government holds out instead of sitting down with the Nurses Unions and trying to reach a settlement which could be accepted by the nurses and the other public service unions and at the same time not have to give the total increases looked for. Unless they do that very soon we are in for a very difficult time for everyone and the patient will be the main sufferer. Let them not try to put the blame on the nurses as it all stems from the authorities. When they went trying to recruit 500 or so nurses in England and ended up attracting less than 100, many of whom have since left the sytem again, they should have seen the writing on the wall and took a serious look at what they were not doing and change the policy so as to make nursing in Ireland an attractive workplace so that patients would have a safer and faster service, preventing illnesses becoming terminal and leading to needless deaths.